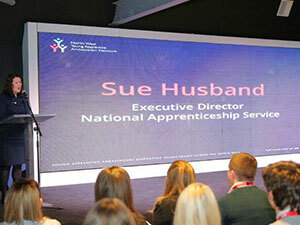 Getting National Apprenticeship Week off to a rousing start we’ve got a very special guest blog from Sue Husband, Director of the National Apprenticeship Service. Today she shares her insights and hopes for the future! Today marks the start of National Apprenticeship Week. I am genuinely very excited – the entire week is about showcasing the excellent work that has been taking place across the country. It’s also about telling everyone the simple message – an apprenticeship can take you anywhere. Apprenticeships can be summed up in two phrases – ‘opportunity’ and ‘unlimited ambition’. They unlock career opportunities by providing experience, qualifications and vital business knowledge, giving people the chance to acquire skills that can be used in any industry. Gaining these skills enables people to progress in their career choices at any stage of their lives. And for employers, apprenticeships make strong commercial sense – they help employers fill skills gaps and allow them to immerse future talent in the culture and values of their businesses. Ultimately, they help businesses improve the quality of their products and services. It’s fitting that this blog is being hosted by UKFast – an organisation that needs absolutely no prompting when it comes to apprenticeships. UKFast is a National Apprenticeship Award winner and its CEO – Lawrence Jones MBE – has led the way in Greater Manchester by encouraging other businesses to embrace apprenticeships too. I have been impressed by how UKFast has reached out to over 45 schools – to find the talent pool it needs to compete in a challenging marketplace. In fact, the last time I was in Manchester, I spoke at UKFast Campus – alongside the company’s Managing Director, Jonathan, and one of their apprentices, Tim – at the launch of the North West Young Apprentice Ambassador Network. The Network is the perfect voice for apprentices to shout about their achievements and to inspire other young people to follow their path to success. For employers who were involved, such as UKFast and Bentley Motors, it’s the ideal platform to engage with other North West businesses and ignite real interest in apprenticeships. Being amongst the apprentices that day was such a rewarding experience for me personally. It was a brilliant event – all the apprentices coming together to tell their own stories of how an apprenticeship has impacted so positively on their lives. I got a clear sense of the desire, the enthusiasm and the dedication that apprentices exude. Today’s apprentices are tomorrow’s leaders, pioneers, innovators and CEOs. Employers are now definitely in the driving seat for designing apprenticeships; they have the crucial say on how apprenticeships are run. These new Trailblazers apprentice programmes are being supported by over 1,300 employers who have designed and published 205 new apprenticeship standards. My hope is that National Apprenticeship Week will motivate more employers to get involved – and pledge to either take on apprentices for the very first time or rapidly expand an existing commitment to apprenticeships across even more operations of a business. The apprenticeship reforms all have a common goal. We want apprenticeships to be relevant, resilient and respected. Programmes that are relevant to the priorities businesses shout about and to the apprentices undertaking them. Resilient apprenticeships that are both challenging and fit for purpose. Apprenticeships that are respected, valued, and held in esteem by employers, individuals and wider society – apprenticeships that we are all proud of. Collectively, we can all play our part in achieving this. Let’s – all together – make National Apprenticeship Week a great success. Find out more about our apprenticeship scheme!